ALL of our vanities are made to order; therefore EVERYTHING is customizable. 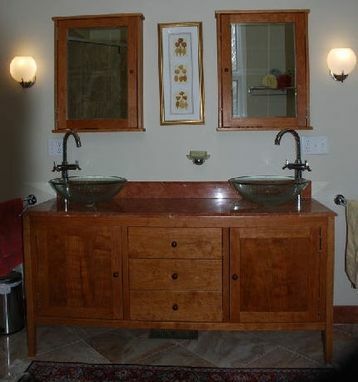 The vanity in the picture is a Shaker Style Double Sink Vanity with two doors and three drawers in the center. We'll cut our solid wood top to fit your sink(s) or you can have your top locally made and installed. Our sturdy vanities will hold the heaviest stone tops made. Knobs are available in Antique Brass, Antique Pewter, Oil Rubbed Bronze, Matte Black, Polished Antique Brass, Polished Brass, Polished Chrome, Polished Nickel, Satin Nickel and Satin Silver. Knobs also come in natural cherry or painted to match finish. Our standard is 31 1/2" H x 22 1/2"D but if you need a different height and/or a different depth -- No problem and NO charge! We will even design around your current plumbing for FREE. FREE Design Service: We will send you CAD drawings for your review and approval before any construction begins. The vanity picture is made from solid cherry and is 66" wide with a custom marble top and backsplash. The matching medicine cabinets are our standard 4" deep surface mounted cabinets. Oil Rubbed Bronze hardware was chosen.